Finance sector organisations – including banking, insurance and investment industries, representing over 300 institutions with $10 trillion in assets – have today released a joint statement in support of a sustainable financial system for Australia and New Zealand. 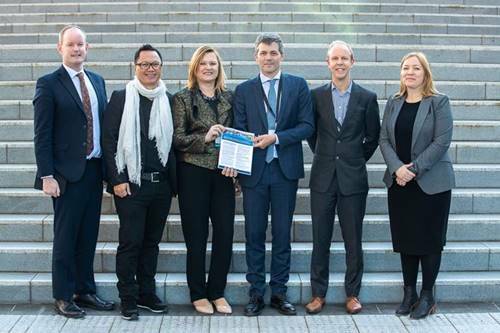 Released at the 2018 UNEP FI Conference in Sydney, co-hosted by IAG and NAB, the Joint Statement in Support of a Sustainable Financial System for Australia and New Zealand calls on organisations across the finance sector to support the development of Sustainable Finance Roadmaps for Australia and New Zealand. A Sustainable Finance Roadmap is a set of recommendations across policy, regulation and finance practices that helps the finance sector contribute systematically to a more resilient and sustainable economy. A growing number of regions and countries globally have developed Sustainable Finance Roadmaps to increase the resilience and sustainability of their financial systems to environmental and social shocks and stresses. Signatories to the statement have committed to convene finance, government, civil society and consumer bodies to kickstart the process to develop Sustainable Finance Roadmaps for Australia and New Zealand. Signatories include the Investor Group on Climate Change, the Principles for Responsible Investment, the Responsible Investment Association Australasia (RIAA), the UN Environment’s Principles for Sustainable Insurance, and the UN Environment Programme Finance Initiative. The Joint Statement in Support of a Sustainable Financial System is available here. For additional information about the UNEP FI Financing a Resilient and Sustainable Economy event, held in Sydney on 23 and 24 July 2018, please click here. Read more about this on NAB’s website here.